Who better to call your landlord than the Oscar-winning Leonardo DiCaprio? 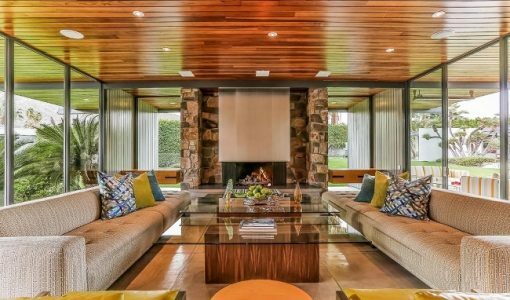 Yes, the actor finally caught a break by winning an Academy Award and now you can get a taste of the A-List lifestyle by renting his Modernist Palm Springs pad. DiCaprio bought the Mid-Century property, designed by architect Donald Wexler, back in 2014 and has made it available to rent since last year. Set on a 1.3-acre desert site, the 7,000 sq ft home has six bedrooms, spa facilities, a heated swimming pool and a floodlit tennis court. The property’s interiors features floor-to-ceiling glass walls, wooden ceilings and stone walls. Crucially, the Dinah Shore Estate, as it’s known, has Wi-Fi. Prices start at a wallet-squeezing $4,500 a night — but nothing comes cheap or easy in the world of a Hollywood star. To see photos of this luxury rental at CNN, click here.